A project maybe funded by and carried out by one or many organizations (or individuals). A transaction takes place between two organizations (or individuals). 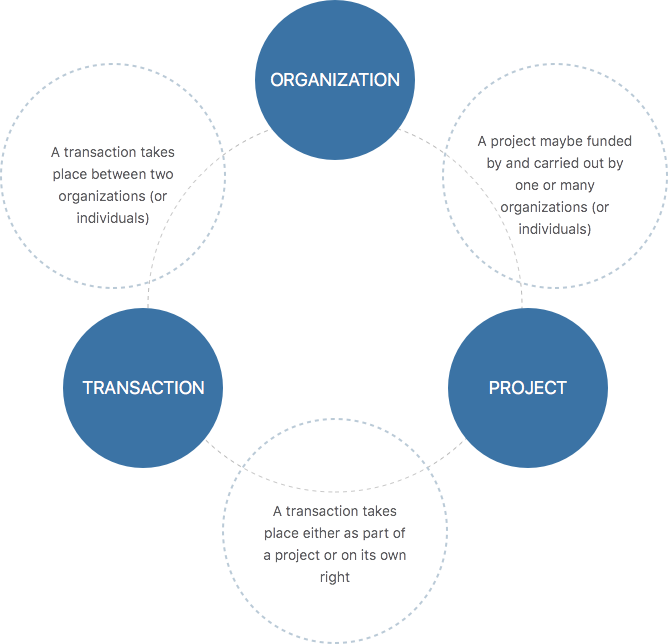 A transaction takes place either as part of a project or on its own right. Note: The portal data model is derived from the IATI data model. Compared to the IATI model the portal model omits less important attributes and a small number of adjustments have been made. These adjustments will be detailed separately in a forthcoming blog. The list view shows multiple records and relevant subtotals of financial data. The detail view shows only a specific record with all its attributes. It allows to browse through data records based on the references between the entities (see figure above). It is for example possible to browse along a funding chain from the primary donor to the last receiving organization. A list view can be filtered according to selected attributes of the main entity. The following points are intended to give you a feeling for what can and can’t be done with the data available in the portal. Please also check the glossary to ensure that you have a correct understanding of the terms and concepts used in the portal. E.g. it is very important that you understand the meaning of the different transactions types used in the portal. Use transaction or project detail data as a starting point for further inquiries, e.g. to check on the ground what the project budget has achieved. Use filtered transaction or project list data to inform yourself about activities carried out according to your filter criteria. E.g. filter project data for health projects in the Gorkha district. However, please keep in mind that while we strive for completeness of each and every data record, some of the data you are filtering by or looking for might not be available at the time of your search. Therefore the result you are viewing might be incomplete. Don’t assume that the data in the portal is complete. I.e. be careful when interpreting totals and subtotals for transaction and project data. The data held in the portal is entirely dependent on what is reported to us or to our secondary sources. Therefore despite our best effort there will always be gaps in the data. In many cases whole records will be missing and in other cases the information we obtained might be incomplete (impacting filter results, if the attribute used as a filter criteria is missing in the data). This work is licensed under a Creative Commons Attribution 4.0 nternational License.